Naturally grown on the Oregon Coast in all colors of the calla lily rainbow. Oregon Coastal Flowers has searched the world for the best varieties of calla lilies for cut flower production. Mostly, we use New Zealand bred calla lilies which yield nice strong stems and marketable calla lily flowers boasting of bright, vivid colors. They are used mostly for weddings. 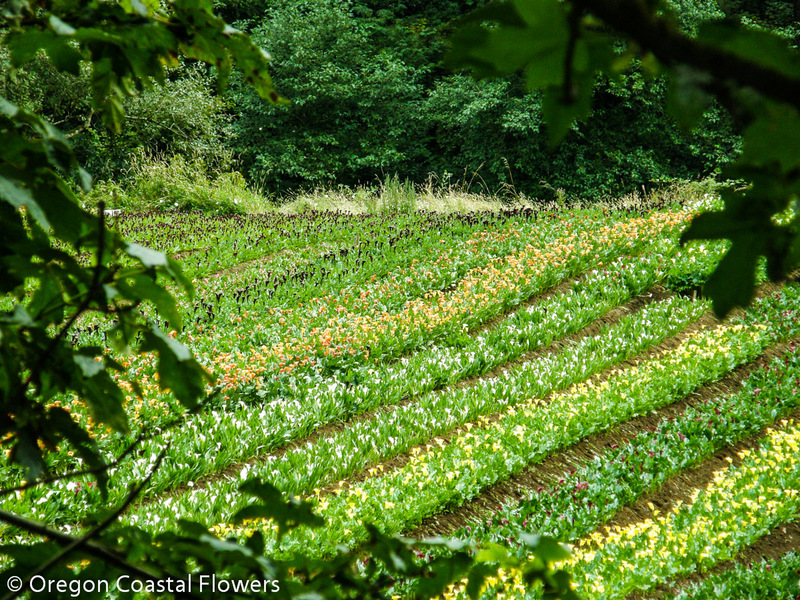 We grow our calla lilies on the beautiful Oregon Coast using sustainable ag practices. Although we are not certified organic, we use many organic practices and grow with minimal chemical input and zero commercial fertilizers. We have been Salmon Safe certified, which means we have been third party certified to be salmon safe for the fish that live in the Kilchis River along our farm. Our calla lilies come in six main color categories: mini white, black/dark purple, red/burgundy, gold/yellow, pink/lavender, and orange/rust. Our mini white calla lily variety is called crystal blush and in warmer temperatures has a slight pink blush on the edges. We also have an ivory and cream calla lily. Hot chocolate is our main color of black calla lily. Besides having a black flower, they also have dark black stems. Majestic red is our best variety of red calla lily. It is actually more of a burgundy color as there is no fire engine red calla lily in the market (at least that we know of). We use pot of gold and florex gold for our gold varieties and black magic for our lemon yellow calla lily. We have pacific pink, pink persuasion, and pink giant for our pink varieties. Orange calla lilies are the most popular and hot shot, flame, treasure, sunrise, and picante are the orange varieties that we use. We sell our flowers inside of color categories. You may request specific shades of a calla lily color, and we will do our best to fulfill it, however, ultimately, shades vary throughout the season and not every shade is available for shipping day. Please refer to our color ranges on the right. If you are interested in our calla lily bulbs please refer to our bulb page. We sell calla lily flowers only by these color categories. Throughout a production season, there are natural variations in calla lily color and varietal production. Orange / Rust calla lilies can range in color from yellow with a red rim, apricot, to brick orange. Pink / Lavender calla lilies can range in color from liliac to two-tone pink to plum color. Red / Burgundy calla lilies range in color from plum to dark red to burgundy. Yellow / Gold calla lilies range in color from lemon-yellow to bright gold.